The highlight of our Shipshewana retreat is always Friday night Show and Tell. I can't keep track of all the quilt makers and still take photos. I thought I would post some of my favorites from the evening. This Dear Jane is made of 2 inch finished blocks. Barb Larson is the maker. Lori became a Goddess and got to wear the crown to have her photo taken with her first Dear Jane quilt. Val made this beautiful Dear Jane. Patty Harrants made this quilt. I believe the pattern or something very similar is published in Brigette Giblin's Feathering the Nest book. Patty's version of Dancing Dollies. A beautiful applique' quilt made by Deb Rammelsburg. Edith Shanholt's Affairs of the Heart quilt. Nancy Martzolf's applique quilt. The pattern is by Rosemary Youngs. I don't know who made this quilt. This is Antique Sampler pattern by Sue Daley. Rosemary Youngs is the maker of this quilt. I believe it is a reproduction of an antique quilt that she either saw or bought (or both). The pattern is available from her. This is my Antique Sampler quilt based on the Ohio Collection book by Anita Shackleford. Anita was our guest speaker before show and tell. My twisted bargello. It has been a UFO for a good many years, and I finally pulled it from the stack and machine quilted it. I still need to stitch the binding down. This is a small hexagon wall hanging that I made as a challenge from Michelle, one of my friends from English Paper Piecing. If you'd like to see other photos from our retreat, here is the link to my photo albums. I returned home from a fun filled week in Shipshewana, Indiana, on Sunday afternoon. I've been at the Jane Stickle Quilt Retreat at the Farmstead Inn located there. It was so much fun to reconnect with old friends and to make new friends. Here are some of the photos from the Farmstead. This photo was taken Saturday during a snow storm. A lot of us had packed winter coats and gloves with us. A lot of us didn't have snow boots. I spent a lot of time drying my socks and shoes and cold feet over the heater in my room. It was really beautiful though. We shopped during the day and ordered pizza delivered to the sewing room our last evening there. This was taken on a day when it was sunny and beautiful but cool and windy. The next few photos are the Farmstead Inn decorated for the holidays. This quilt is huge and is hung on the wall behind the stairway. This beautiful cabinet is in between the doors by the front lobby. The Amish made furniture is just beautiful. This is a sign down by the breakfast room. I'm working on getting my retreat photos up on line where you can view them. I'll post a link when I figure it all out. I'll post more photos from my fabric shopping and show and tell. I hope you are finding some time to stitch today. I will be spending time in the kitchen the next couple of days preparing for our family's Thanksgiving dinner. I haven't done a lot of quilting over the last month, but I have been doing a lot of knitting. This Zick Zack scarf was on the needles for a few months, and I finished it. This is my Colts scarf for this football season. Whenever we score points I knit that number of rows in blue. Whenever our opponent wins, I knit that number of rows in white. You can see that we aren't having a winning season. This is similar to the temperature scarves that a lot of knitters are making. I started this scarf and am making it similar to the way the Colts scarf is made. It's knit in the round forming a tube using leftover sock yarn. Whenever I'm finished, I'll Kitchner Stitch the ends together. I started and finished another pair. The blue ones above are done with sock yarn on size 2 needles. The pink ones below are done with heavier yarn on size 5 needles. I've discovered a short row heel that I really like to use. Here is the pair that I finished last week. I really like wearing knit socks in the winter, so I have another two pair on the needles now. I know this is mostly a quilt blog, but this explains part of my absence from blogging. I thought you might like to see what I've been working on anyway. I'm heading to Shipshewana to a quilt retreat. I'll check in from there. Hello I'm working on my Easy Street quilt again. Easy Street is the Bonnie Hunter mystery quilt from 2012. This is the last Quiltville mystery that I've done. We were selling our other house, packing, and moving during the last couple of mysteries, so I didn't even start those. I'm excited about this year's quilt. Bonnie's colors are rusty red, gold, black and backgrounds. I have lots of those colors in my stash, so I'm ready to go. I thought I should try and get this top put together before starting to cut out the next quilt. I took the Halloween decorations down and put the pumpkins and fall decorations back out. 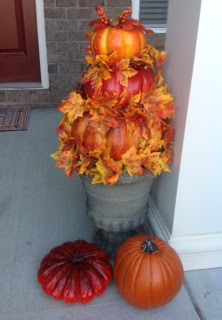 Thanks to my husband who put the holes in the pumpkins for this pumpkin topiary so the dowel rod would go through them and hold them in the pot on the front porch. I made this Halloween post card for my favorite trick or treater. Here he is: My favorite UPS guy having a snack on Halloween night.